Fantasy seems to be Nicolas Cage’s realm as of late. After fiddling with spells and dragons in The Sorcerer’s Apprentice (2010), he is now journeying back to medieval times to deal with magic again – this time of a black type – in Dominic Sena’s Season of the Witch (2011). Set in the 14th century, the movie tells the story of two knights (Nicolas Cage and Ron Perlman) who return to their homeland only to find it devastated by the Black Plague. The Church believes sorcery is the cause of the disease, and the knights are ordered to transport a suspected witch to a monastery, where she will be subjected to a ritual the monks believe will put an end to the plague. Season of the Witch fuses medieval battle scenes, witch hunts and exorcisms in a storyline that flirts with different genres – horror, fantasy, adventure – without quite deciding which one to belong to, as well as taking on religious dogmas and historical facts with unashamed naiveté. One might think director Sena has too much on his plate, but his job is made easy by the fact that the script has no interest in tackling such subjects with any seriousness whatsoever, and only treats them as mere vehicles with which to unfold the story. 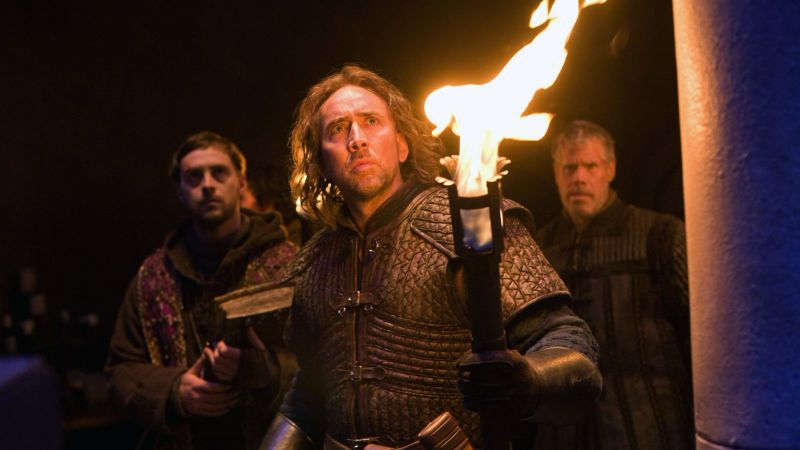 Nicolas Cage is in his comfort zone playing Behmen, the reluctant hero who’s made a mistake and feels the weight of it until he gets his chance of redemption – a classic and somewhat boring formula which, however, certainly works well for Season of The Witch. What is evident is that the movie builds its whole foundation on Cage’s character and unreservedly confides in him to carry the story, but this isn’t enough to deliver a well-rounded and multileveled on-screen narrative. Ron Perlman and This is England’s (2006) brilliant Stephen Graham star as Behmen’s companions Felson and Hagamar, but don’t get their chance to shine – or even to be noticed at all – and the rest of the characters are remarkably and unsurprisingly plain. The make up and special effects are also not particularly concerned with precision or believability, but instead are used to visually render the movie’s own unashamed interpretation of history and religion – in which witchcraft is explained as demonic possession, and the devil himself appears as an oversized CGI bird. All in all, it would be a mistake to see Season of the Witch as a serious adventure movie (we doubt anyone was going to anyway); instead, it is simply an exercise in unpretentious filmmaking with a big budget.